Canned cream of mushroom soup is a cooking staple in many homes, used to make gravies, sauces, and other soups. But it is a processed food and contains many ingredients that are probably not good for your health, including MSG. Plus the can is lined with a type of plastic (bisphenol, as in BPA or BPB) that has known health issues. Far better to make your own, from scratch. Years ago, I had a Texan housemate who cooked from a box. One day he announced he would make dinner for us, from a box as usual. I don’t recall the exact dish, but it required a can of cream of mushroom soup. I’d been trying to show him he could make all his box-dishes from scratch, almost as easily as using the box, so I offered to make the mushroom soup for him. He was quite skeptical about this. However, when the wonderful aroma reached his nostrils, he was totally amazed and had to call all his old friends back home in Texas to tell them about this wonder. The first soup recipe below, adapted from Soup, by Coralie Castle (1) and from The Vegetarian Epicure by Anna Thomas (2) does not include cream. The second soup recipe is the one I used for my housemate. I’ve never tired the Sherry adaptation based on a version from Soup, by Coralie Castle (1). To make sauce, thicken the soup with blended egg and cream. 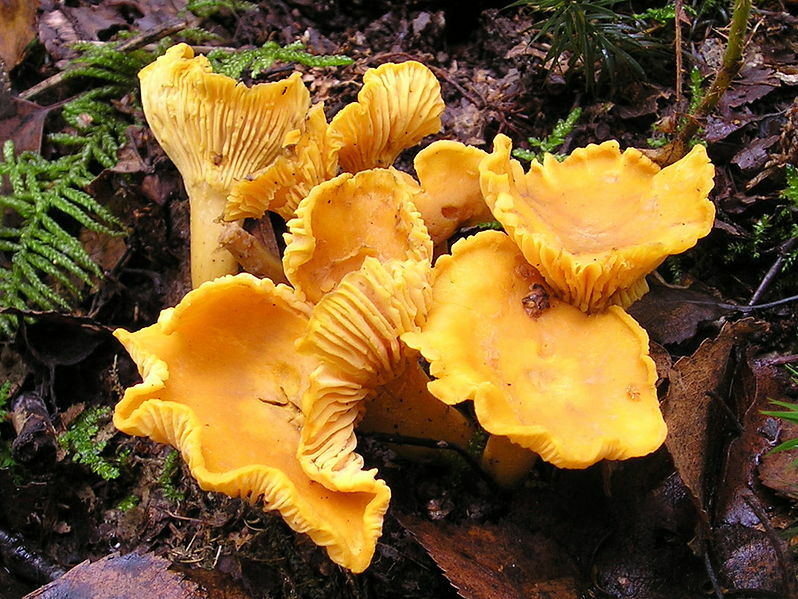 You can use any edible mushroom for this recipe – chanterelles make an especially delicious soup (photo, left, from Wikimedia Commons) – but if you are making this to use in a recipe instead of canned soup, I suggest using button or champignon mushrooms (see photo above), which are available in almost every grocery. Did you know that the more expensive portobello or crimini mushroom is a cultivar of the button mushroom? I make a full batch and freeze a good portion of it in pint Mason jars for future use in recipes. NOTE: See next recipe for Creamy Velouté (Cream of Mushroom) Soup. Serves 6. Prep the veggies: set aside 8 mushroom caps; slice remainder. mince onion, celery and garlic. Grate zest. Wash fresh herbs and dry in cotton towel. Slice, then sauté the reserved mushroom caps in 1 Tbsp butter over medium-low heat. Set aside. Add more butter or oil and sauté the minced veggies until soft. Add the uncooked mushroom slices and seasonings (including lemon zest) and continue to cook until the mushrooms are lightly browned. Sprinkle with flour/starch and continue to cook and stir for 3 minutes. Gradually add stock, stirring until smooth and it begins to thicken. Reduce heat to simmer (use a simmer plate if necessary to keep soup from boiling), add parsley and thyme, cover the pot and simmer 30 minutes. Add reserved sautéed mushroom slices, simmer 5 minutes more. Adjust seasoning with salt and pepper. Adapted from Mastering the Art of French Cooking, by Julia Child, Louisette Bertholle and Simone Beck (3). Serves 2. Warm 2 cups Mushroom Velouté Soup (above) in heavy-bottomed, enameled saucepan using a simmer plate. Stir 1/2 cup heavy cream, or milk/cream mix, into the soup and warm again. Do not let it boil. Adjust seasoning, adding a pinch of ground nutmeg if desired. Swirl in 2 Tbsp butter, if desired. This recipe is based on a version from Soup, by Coralie Castle (1). Proportions of sherry and cream to base soup are from Mastering the Art of French Cooking, by Julia Child, Louisette Bertholle and Simone Beck (3). Add sherry and cream (or milk and cream), and warm using a simmer plate. Adjust seasoning. Garnish with slivered almonds, if desired. This is an enriched version of the soup, which I recommend for use in creamy casseroles. the yolks thicken the soup slightly (the more yolks, the thicker the sauce). Proportions of yolks and cream to base soup are from Mastering the Art of French Cooking, by Julia Child, Louisette Bertholle and Simone Beck (3). Beat yolks with cream in bowl; whisk in 1/2 cup hot soup, then whisk this into the remainder of the soup in the saucepan. Reheat, using simmer plate, so that the mixture does not boil. Swirl in butter and adjust seasoning as needed. 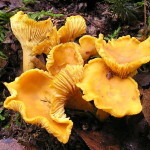 This entry was posted in Alcohol, Dairy, Eggs, Fat or oil, Fungi, Grain, Herbs, Onion family, Pseudo-grain, Sauteed, Simmered, Spices, Stock, broth and tagged celery, cream, egg, garlic, lemon, mushrooms, nutmeg, onion, parsley, sherry, thyme. Bookmark the permalink.